Wednesday July 28th 1909 It was a very warm day We did the regular work and a little fancy work and visited. We heard through the home folks that Will [Chalfert?] died last night a letter from Lydia and she says Jane & son Will do not expect to come here to visit Thursday July 29th 1909 Mary went down at 10.12 to spend the day at Aunt Libs I got the dinner over and Will went at 1.12 and I an hour later. will met me with a carriage and we went up to Will [Chalforts?] funeral. 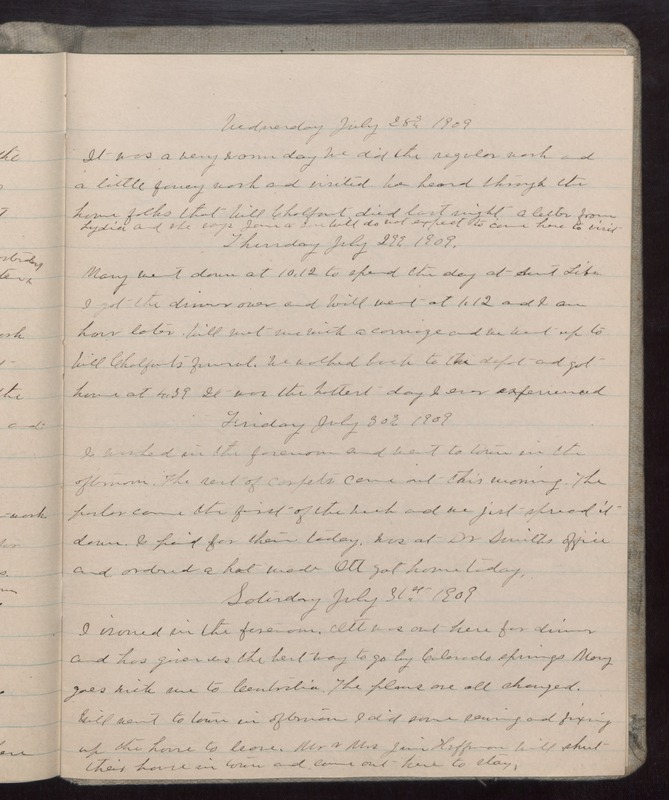 We walked back to the depot and got home at 4.39 It was the hottest day I ever experienced Friday July 30th 1909 I worked in the forenoon and went town in the afternoon. the rest of the carpets came out this morning. The parlor came the first of the week and we just spread it down. I paid for them today. was at Dr Smiths office and ordered a hat made Ott got home today. Saturday July 31st 1909 I ironed in the forenoon. Ott was out here for dinner and has given us the best way to go by Colorado springs Mary goes with me to [Centralia?]. the plans are all changed. Will went to town in afternoon I did some sewing and fixing up the house to lease. Mr & Mrs Jim Hoffman Will shut their house in town and come out here to stay.